Character. Cost: 7. STR: X.
X is the number of kiss tokens Beric Dondarrion has. 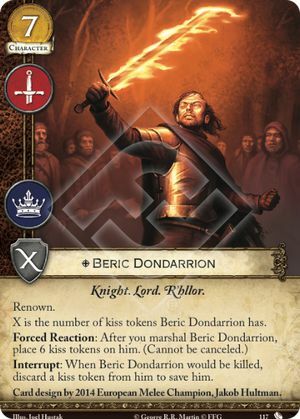 Interrupt: When Beric Dondarrion would be killed, discard a kiss token from him to save him. Card design by 2014 European Melee Champion, Jakob Hultman. The Brotherhood Without Banners #117. Beric's printed STR is 0. If his text box is blanked (via Milk of the Poppy or Nightmares), his base STR becomes 0. If Beric is marshaled while Blood of the Dragon or Fortified Position is revealed, his Forced Reaction will not get a chance to trigger. If Beric's Interrupt ability is cancelled (via Treachery), you cannot attempt to use that same ability to save him again (all reactions and interrupts can only be triggered once per ability per triggering condition). Do you think that the strength of Beric Dondarrion is "0" when someone marshall House Florent Knight? I try to compare it with the use of The Hand's Judgment on another The Hand's Judgment. Thank you!